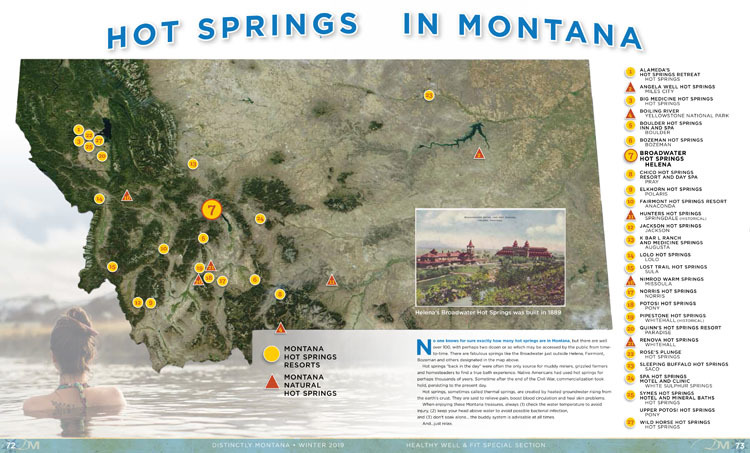 No one knows for sure exactly how many hot springs are in Montana, but there are well over 100, with perhaps two dozen or so which may be accessed by the public from time-to-time. There are fabulous springs like the Broadwater just outside Helena, Fairmont, Bozeman and others designated in the map above. Hot springs "back in the day" were often the only source for muddy miners, grizzled farmers and homesteaders to find a true bath experience. Native Americans had used hot springs for perhaps thousands of years. Sometime after the end of the Civil War, commercialization took hold, persisting to the present day. Hot springs, sometimes called thermal springs, are created by heated groundwater rising from the earth's crust. They are said to relieve pain, boost blood circulation and heal skin problems. and (3) don't soak alone... the buddy system is advisable at all times.